Ferrari World Abu Dhabi, the world’s first Ferrari theme park and largest attraction of its kind, opened its doors on October 28th 2010, three weeks ahead of the second Formula 1™ Abu Dhabi Grand Prix. 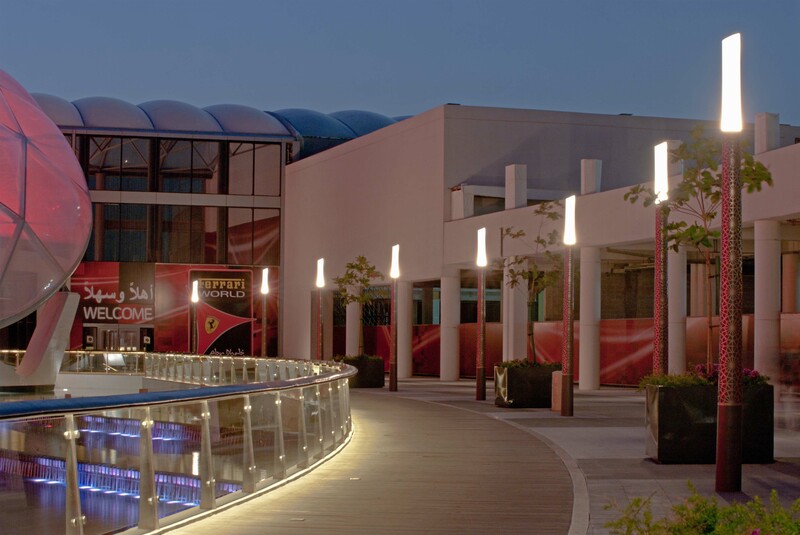 Ferrari World pays tribute to the passion, excellence, performance, and technical innovation that Ferrari has established over the years and represents today. The sleek, contemporary building boasts an iconic red roof that spans 200,000 m² and is directly inspired by the classic double-curve side profile of the Ferrari GT. The setting demanded a similarly iconic lighting solution that would flow cohesively from interior to exterior, echoing the design ethics of the building and resonating with the middle-eastern location. Marshalls worked closely with the project designers to develop an elegant cylindro-conical lightstack in painted mild steel, overlaid with an immaculate sheath of contrasting 316 brushed stainless steel. Working with scant concept sketches, the particular challenge of this product was the deployment of a 3 axis laser to cut the tapered cladding into the distinctive geometric pattern with a high level of accuracy and perfect symmetry. 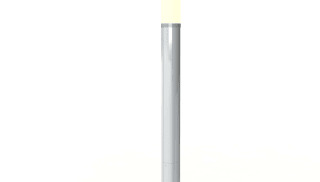 The source of the lightstack’s illumination is a 150w metal halide lamp, installed to uplight the top of a fully sealed, partially frosted acrylic cylinder. The illuminated section has an aluminium reflector mounted at 22 degrees into the top, to reflect the upward light back toward the ground, providing a subtle, yet functional, glow around the walkways into the building and throughout the interior. To date, Marshalls has supplied 40 lightstacks to this prestigious scheme and continues to support the project as it develops. Ferrari World Abu Dhabi is located on Yas Island, a 25 km² entertainment and recreation destination which, when completed, is set to become a global tourist destination. Yas Island is one component of the mass infrastructure development outlined in the Abu Dhabi Government’s 2030 Plan to diversify and expand the Emirate’s economic base. Ahead of the inaugural Formula 1™ race in November 2009, Aldar delivered the Yas Marina Circuit, 7 brand new hotels, Yas Marina and all the infrastructure and race-related facilities. A number of new entertainment attractions are planned for the coming years, including the first Links golf course in the region and a super regional mall and water park. To provide a site-specific lighting solution suitable for both interior and exterior spaces and worthy of the quality demanded by the client. The development of a bespoke lightstack sympathetic to the Ferrari design and material philosophy yet appropriate to the distinctive location within the United Arab Emirates. A stunning aesthetic, combined with manufacturing excellence, have delivered a unique product that perfectly meets the technical demands of both the brief and the challenging environment.